Fifteen years ago on Mach 30, 2001, The Ritz-Carlton, Half Moon Bay opened as the San Francisco Bay area’s only luxury oceanfront resort. In celebration of its Crystal Anniversary, guests can enjoy a celebratory overnight experience, as well as crystal-themed treatments in The Ritz-Carlton Spa. The Ritz-Carlton Spa offers a lavish setting to indulge in relaxation and rejuvenation. The Spa features 16 treatment rooms, including two couple’s rooms and three facial rooms, as well as a co-ed Roman mineral bath. Throughout 2016, guests can enjoy the signature Crystal treatments. Renew your body and mind with this deeply relaxing, intentional aromatherapy massage. Using blends of essential oils known for their healing properties, your therapist will guide you through meditative breathing techniques as you are massaged using classic long, fluid strokes to relieve muscle tension. To help balance energy and restore equilibrium during your experience, chromo-therapy is infused throughout the treatment. Select from the following intention; Tranquility Clarity Healing. The treatment is $265. The TATCHA Crystal Luminous Facial is a true experience in relaxation. This 90-minute ultra-hydrating and firming facial incorporates a combination of rice enzyme powders, rich in vitamins, minerals, and proteins, to exfoliate and brighten the face while a deep hydration mask revitalizes and moisturizes. Centuries-old Japanese acupressure techniques incorporating a signature TATCHA crystal lifts and promotes relaxation and warm chamomile towels warm the muscles and release tension. This luxurious experience is enhanced with neck and shoulder compressions and an application of enriching renewal cream and silk body butter to arms, legs and feet. The facial concludes with a cool TATCHA crystal massager to awaken the skin to a luminous glow. The 90-minute treatment is $285. Explore the benefits of going beyond organic with Eminence’s Crystal Clarity Facial. Derived from the purest ingredients, this first and only Globally Certified Organic skin care line will leave you feeling and looking radiant. Your facial experience is further enhanced with the use of NuFace micro current technology that assists in revealing smoother and more contoured skin. This purifying treatment offers customized deep exfoliation that’s aids in rejuvenation. This calming and hydrating treatment is perfect for all skin types. The 90-minute treatment is $285. The idyllic property provides a magnificent backdrop for a getaway along the coast. 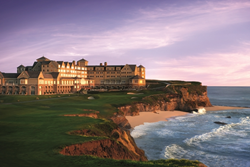 Diverse, vibrant surroundings of The Ritz-Carlton, Half Moon Bay include world-class beaches where guests can enjoy spending the day relaxing on the sand and in the surf or partaking in other ocean activities including surfing, kayaking, paddle boarding and tide pool viewing. Guests can also participate in stunning coastline diversions like a Segway® tour where they can view an assortment of wildlife, native plants and shore birds along the beautiful Half Moon Bay Coastal Trail. For the more adventurous, Half Moon Bay offers tours and excursions such as whale watching excursion, horseback riding on the beach, and deep sea fishing. Golfers can experience the enchantment of Northern California’s Scottish links on two championship courses that stretch from pines to cliff at The Golf Links. Situated 23 miles southwest of the San Francisco International Airport, The Ritz-Carlton, Half Moon Bay is a 261-room coastal hotel and the San Francisco Bay Area’s only luxury oceanfront resort. Set atop a rugged bluff overlooking 50 miles of pristine California coastline, the timeless oceanfront estate provides guests with a relaxed yet refined experience. For more information, contact your travel professional, visit http://www.ritzcarlton.com/HMB or call The Ritz-Carlton reservations at 800-241-3333. Visit http://www.experiencehalfmoonbay.com to learn more about the destination.